den September 8, 2015, 6:33 p.m. The monarchy's enduring popularity has been confirmed by new YouGov research, with a resounding 68% of the British public believing the institution to be good for the country. It comes as Queen Elizabbeth II becomes the longest serving monarch in British history - overtaking Queen Victoria’s reign of 63 years, seven months and two days. Support for the institution is wide ranging - with the monarchy gaining majority support from voters of all political parties and every age group. 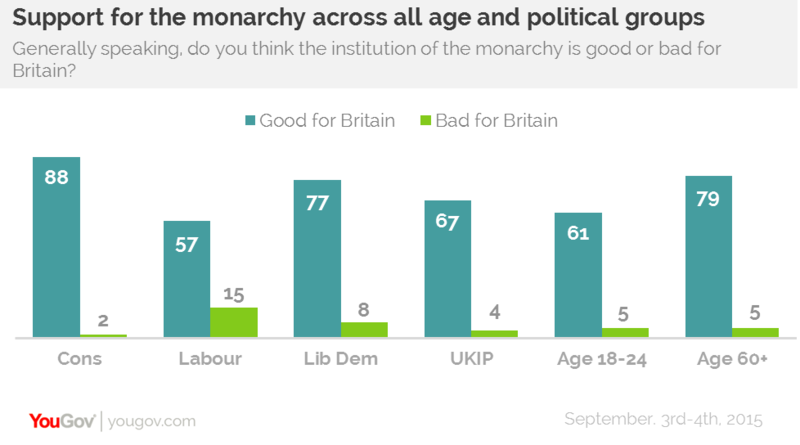 Older people are most enthusiastic, with almost eight in ten over-60s saying the monarchy is good for Britain. Looking to the future, the majority is even confident that the Royal Family is here to stay. 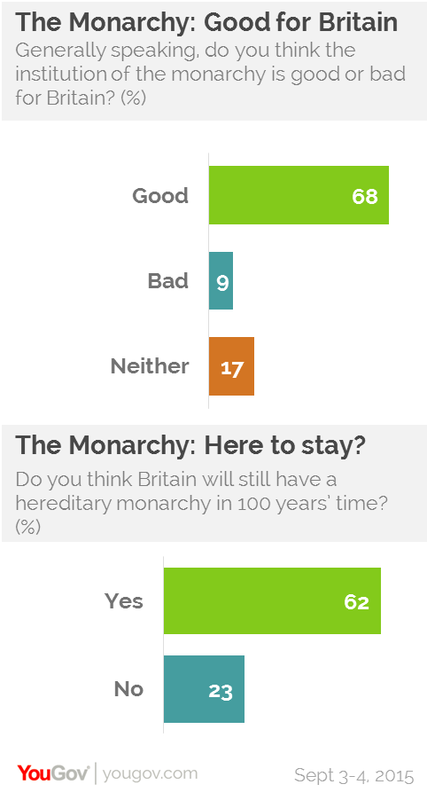 More than six in ten (62%) believe Britain will still have a monarch in 100 years' time – a view that hasn’t changed dramatically since the Jubilee in 2012. The British public fully support the monarchy continuing. Over seven in ten (71%) adults believe the British monarchy should remain, with less than a fifth (18%) saying we should have an elected head of state instead. This view has remained roughly consistent over the last few years of YouGov research. On certain specific questions the public is less convinced. The public is somewhat more divided on whether the Queen should open up and be less private, with 32% wanting this compared to 50% who prefer her to remain private. Furthermore, only 16% believe Camilla should be called ‘Queen’ when Charles becomes King compared to 38% that prefer the title of ‘Princess Consort’. Just less than a third (32%) feel she should be given no title at all.